It was stylistically important for several reasons. First, it departed from all common car and truck-body conventions. There were no fenders on the Doodlebug, certainly not in any normal sense. The conventional hood was gone, as were the running boards, cowl,and setback windshield. 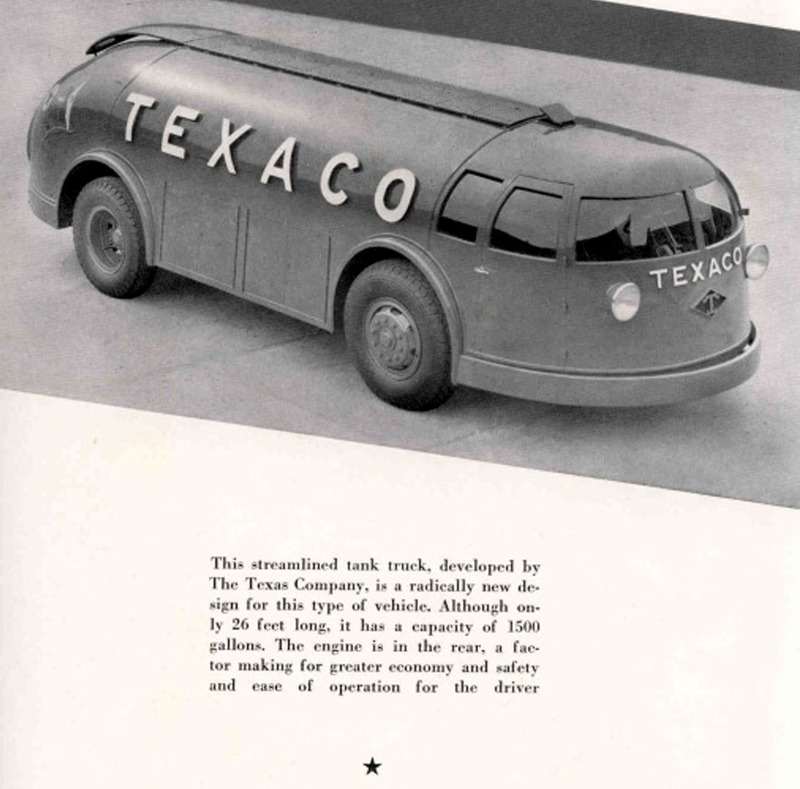 The "little house on wheels" that made up the passenger compartment of most vehicles of the day was visually absent. The Doodlebug's bread-Ioaf shape was all of one piece and, except for the applied headlights, could have been designed today. Second, the Doodlebug used curved side glass and a compound curved windshield. This last innovation didn't see mass production until the '57 Chrysler Imperial. The "through" body sides were at least 13 years ahead of their time--Kaiser and Frazer put the idea into production for 1946. The eyebrows over the full wheel cutouts reappeared as a focal point on the '66 Olds Toronado. 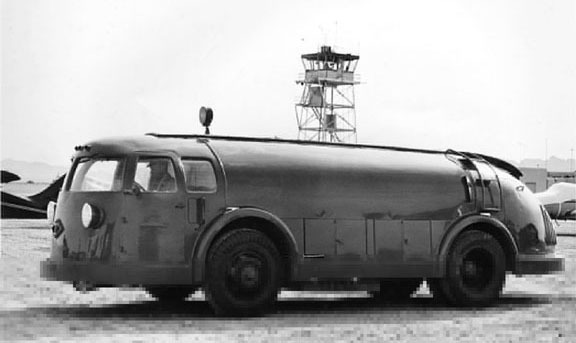 Third, the Doodlebug tapered toward the rear and had considerable uninterrupted tumblehome curve, which were unusual features in that day of boxy bodies. Most surprising was the overall height. 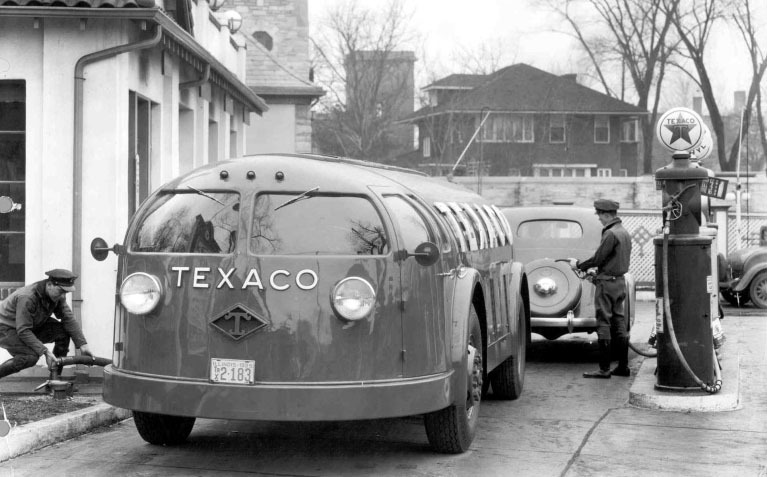 At 72 inches, the Doodlebug stood a mere 4 inches higher than a '34 Ford sedan. No one was building trucks that low in those days, nor do many manufacturers do so even today. Bel Geddes' inspired Texaco fleet, helped prompt other oil companies to produce similarly streamlined commercial vehicles. Nice Doodlebugs. I've never seen a photo with open compartment hatches. One small suggestion from an annoying know-it-all - the limo's a Caddy. Thanks for sharing the photos! Really nice design much ahead of its time. Great pics. from the looks of it, it is light years ahead of its time. In most trucks that carry fuel, you also have the problem of the liquid sloshing around causing it to rock back and forth, an can sometimes tip the truck over. 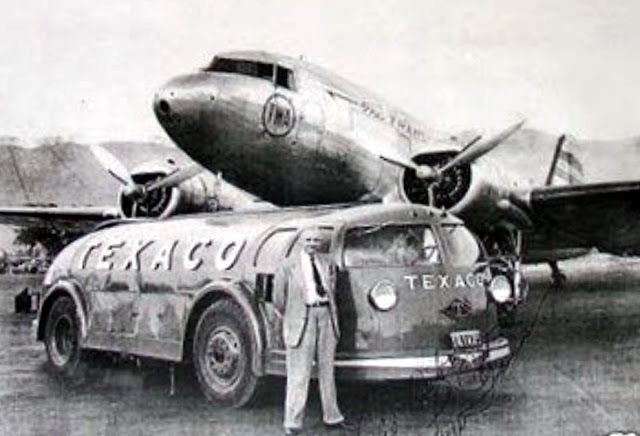 Liquid sloshing isn't a big problem when you put internal baffles in each tank compartment to restrict fluid movement - they've been doing that since the 1920's. But the extremely low Center of Gravity, roll center and low wind profile would be a huge boon for making fuel deliveries to smaller stations and farms way out on the Plains and Deserts, especially when the forecast says "Winds 60 MPH, gusts to 110". And even more valuable when driving back empty. Not to mention every gallon of fuel the tanker burns comes out of profits. Great collection of photos, many thanks! 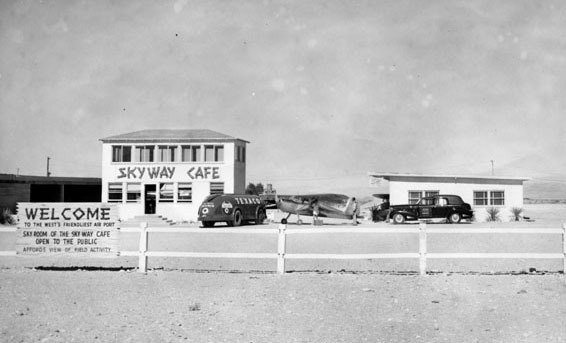 Looks like in photo Doodlebug fueling Grand Canyon Airline at Boulder City, NV. 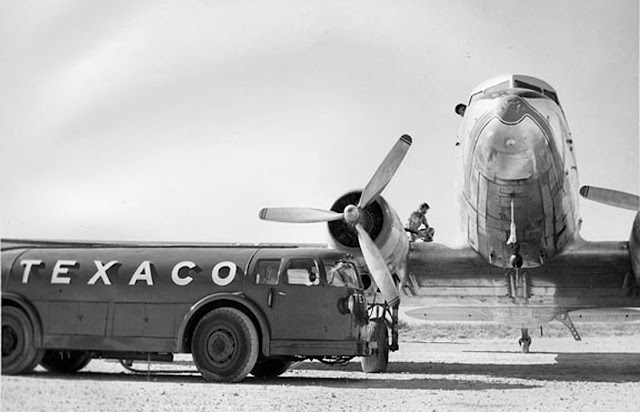 the plane is a Lockheed Electra Model 10. 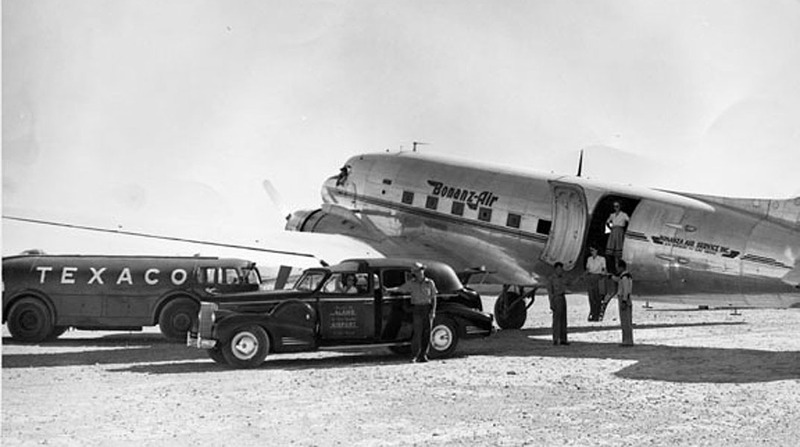 A rare bird in itself as only 149 total ever built, one of which being, Amelia Earhart's 10-E. This one is probably a Electra 10-A as they were the most produced version at 101 units. Airplane in back is unknown to me. I was writing a post including a Tootsietoy 1930's "Doodlebug" toy car and was curious if there was ever a "real Doodlebug car. 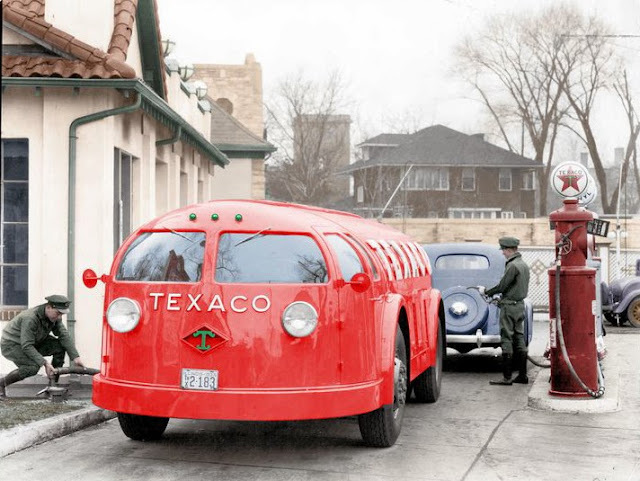 I came across this post of the Texaco Doodlebug gas truck, which is quite interesting. The reason for my writing is to ask if I could use the images of the truck for my blog post. My e-mail address can be found at the bottom of my most recent posts on my blog under my name in blue. I don't own the images, you sure can use them.